Narrative is an architectural concept design created with heavy body acrylic paint, sketching crayon, and compressed charcoal. This concept design is painted on 18″ x 24″ archival 140 lb. paper. This is a one-of-a-kind original piece. 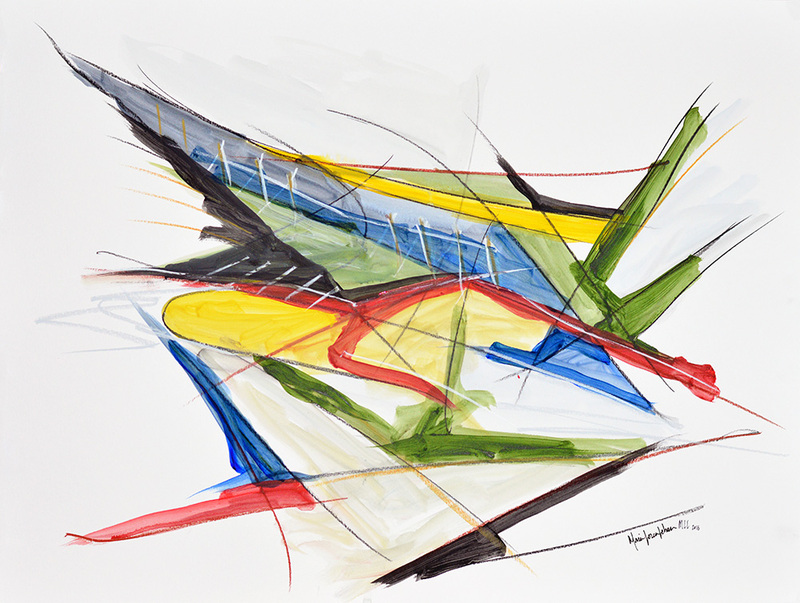 This painting explores the behavior of a line as it sets a circulatory path for an architectural design concept. By isolating the pathway, new circulatory opportunities arise and this is depicted by using color within the work. Such pathway opportunities can be translated into experiential flows, where narrative unfolds as one color/experiential path gives way to another. One may ask: Can an architectural journey be designed by sculpting the experiential path first? This work is an attempt to seek this answer.